Pakistan's former prime minister Nawaz Sharif, his daughter and son-in-law are set to return to the jail on Monday after the end their five-day parole granted to them to attend the funeral of his wife Begum Kulsoom, who died last week in London after a battle with cancer. Kulsoom Nawaz, the wife of former prime minister Nawaz Sharif, died in London after a period of prolonged illness, at the age of 68. 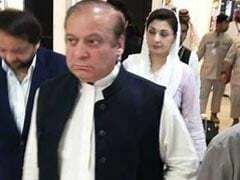 Pakistan's jailed former prime minister Nawaz Sharif, his daughter Maryam Nawaz and son-in-law Capt (retd) Muhammad Safdar reached Lahore in early hours of Wednesday after they were released from Adiala Jail Rawalpindi on a 12-hour parole to attend the funeral of Begum Kulsoom Nawaz. 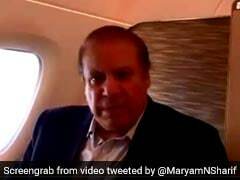 An unseen video of former prime minister Nawaz Sharif bidding farewell to his wife Begum Kulsoom Sharif for the last time has gone viral on social media soon after her death in London Tuesday. 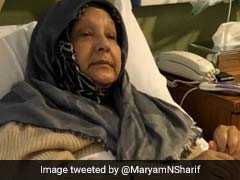 Kulsoom Nawaz, wife of jailed former-Pakistan Prime Minister Nawaz Sharif, has regained consciousness but is still on ventilator, said Sharif's son Hussain Nawaz. 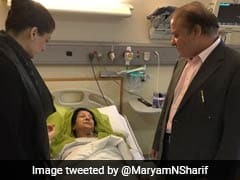 Ahead of former Prime Minister Nawaz Sharif and daughter Maryam's arrest, Nawaz's wife, Kulsoom Nawaz, opened her eyes after a month-long coma. Hours before his imminent arrest upon landing in Pakistan, Nawaz Sharif made an appeal to his countrymen, urging them to stand with him and "change the fate of the country". A picture of former Pakistani prime minister Nawaz Sharif and his daughter Maryam bidding farewell to Begum Kulsoom Nawaz, Mr Sharif's ailing wife, before their return to Pakistan for their imminent arrest, has struck an emotional chord with many in the country. 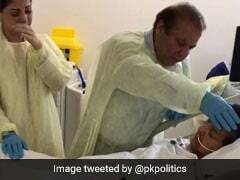 After being put on life support, Ms Kulsoom opened her eyes once, said doctors in London. Nawaz Sharif and his daughter, Maryam Nawaz have delayed their return to Pakistan after doctors' advise. 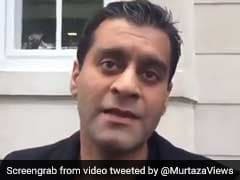 A man allegedly sneaked into former Pakistan Prime Minister Nawaz Sharif's wife Kulsoom Nawaz's hospital room without permission at London's Harley Street Clinic on June 16. Kulsoom, 68, had suffered a cardiac arrest in the intensive care unit of a London hospital on Friday and was put on ventilator as her health deteriorated.